I know that not everyone is into insects…but I once read the title of a book that described best how I feel: it’s from a quote by evolutionary biologist J.B.S. Haldane (and sometimes credited to Charles Darwin), stating that because of the staggering number and variety on them earth, that whoever our creator is, they must have “An Inordinate Fondness for Beetles.” That pretty much sums up my own feelings. 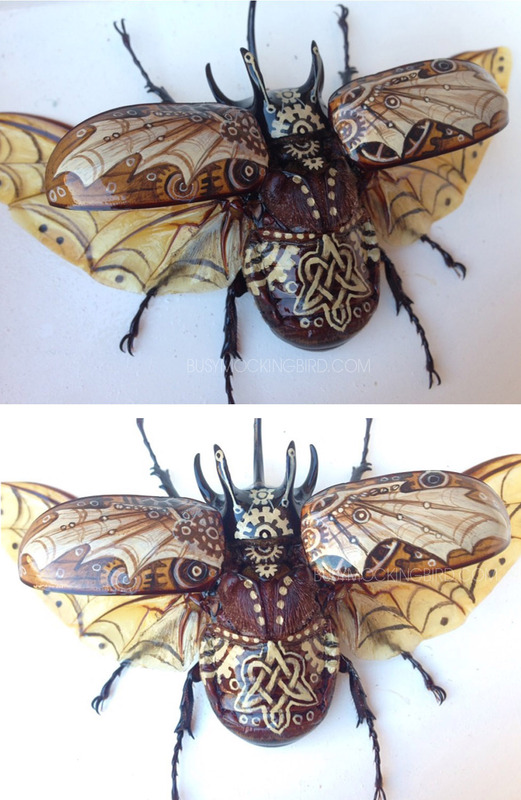 I did a post on my beetle painting ages ago, describing how I once looked up at a mounted beetle in my room and wondered, “what might a beetle choose if it could customize it’s wings? Thus sprang my “Bad to the Exoskeleton” paint job. I usually make my Christmas gifts, which usually stems from something I’m interested in at the time. Mom says when I try to hard to do what I THINK someone will like the WAY they like it, it never ends up as well as something I do for someone that’s in my own style, sort of INSPIRED by that person. I started working on this one for my niece, with the idea that it was a softer sort of custom, for a sweeter sort of beetle. Beetles would probably love flowers, in a dainty sort of way, right? Next I worked on a double-mounted set for my parents, featuring a sort of Bavarian flower pattern for my mother’s and an Egyptian themed one for my dad, which I thought matched their personalities fairly well. My mom and dad are both artists, and mom loves Bavarian-style flowers, while dad loves anything related to Egyptology and archaeology. Finally, I worked on the biggest one for my sister, who has a pair of steampunk wings tattooed on her own back. I tried to put as much detail as I could fit on this little guy, with small gears and painted screws. So the holidays are over, and it’s time to start a new year. I’ve never been one to push a year out the door–years are years through no fault of their own. 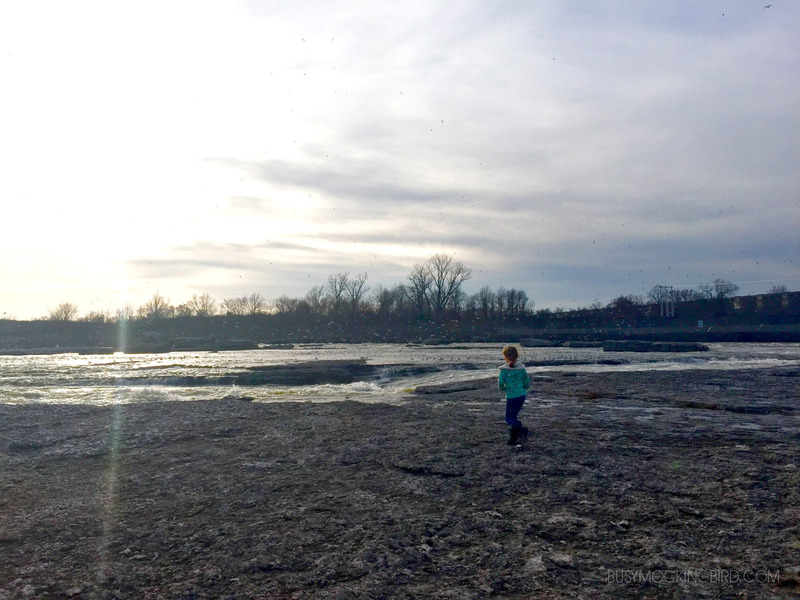 But this year–from the accounts of my own family and my immediate friends and family–I feel like this year needs a good kick in the pants on its way out the door. So here’s wishing that this next year is full of adventures and inspirations, of explorations both internal and external. My husband would probably love one of these. He has a thing for bugs. Wow! Those are amazing. 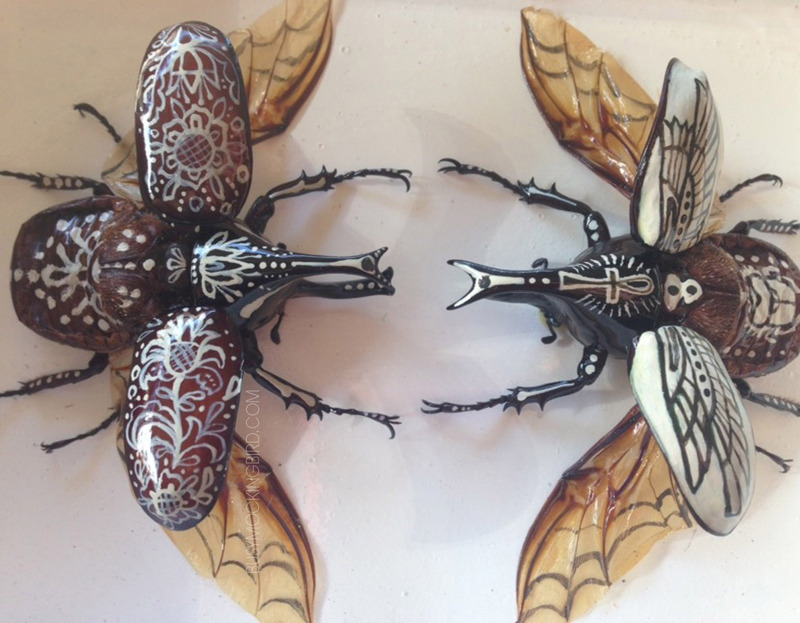 I’m a fan of insects, especially chunky beetles, so I know I certainly would love to be gifted one of these. I imagine all of your recipients were over the moon with your customizations. Did you use actual beetles? Or are they made from clay or something? I’m curious as to what your substrate was. We had pet Madagascan Hissing Cockroaches when we lived in Scotland. They had been bought as food for lizards in a pet shop but the lizards were scared of them so I adopted them and they went from being a meal to being pets. I rather liked them. They were fascinating and were akin to keeping fish as pets. Place, not pale. And unmounted, not undoubted! What a talented artist you are! 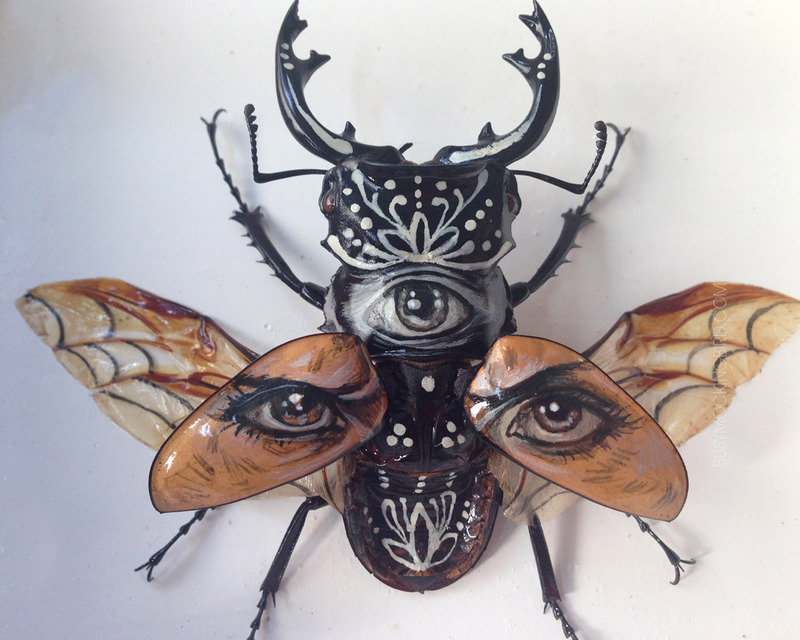 You make insects that most people find unappealing at best and turn it in them into beautiful works of art. I am inn awe of your talent! They’re beautiful, what an original creation. I love it. Excellent read, thank you. I take delight in every one of your posts. 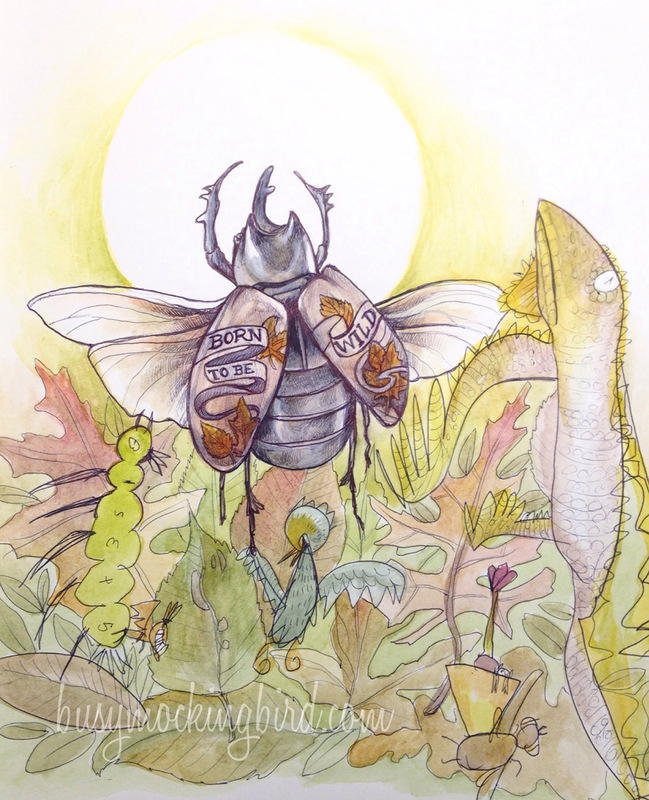 And I totally love beetles — scarabs, dung beetles, stink beetles. These are totally amazing. 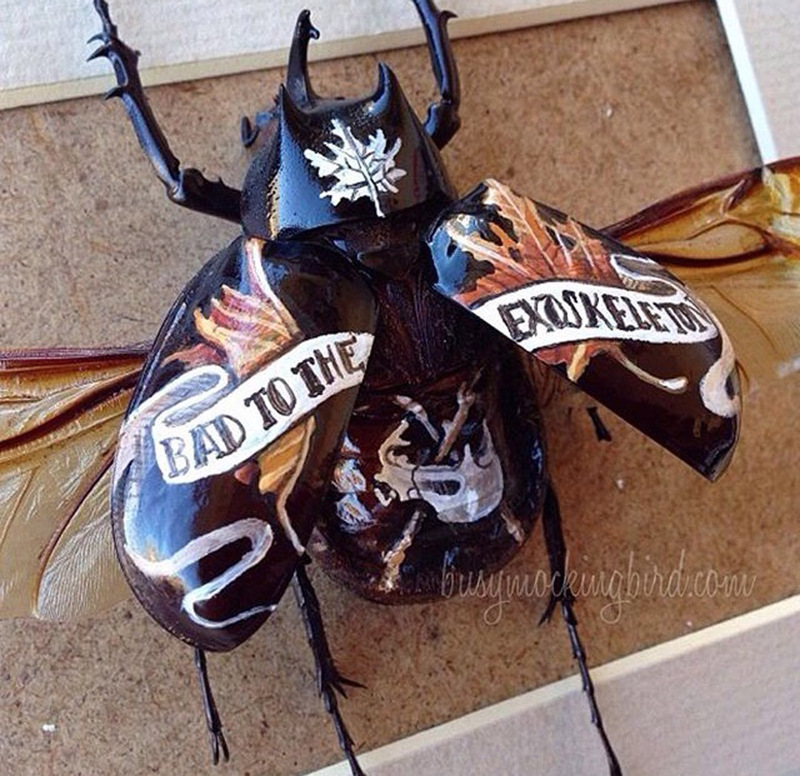 Where did you buy the bug bodies and is it acrylic paint that you use. So stunning. I wish I was one of your family members. I take delight in every one of your posts. And I totally love beetles — scarabs, dung beetles, stink beetles. These are totally amazing. 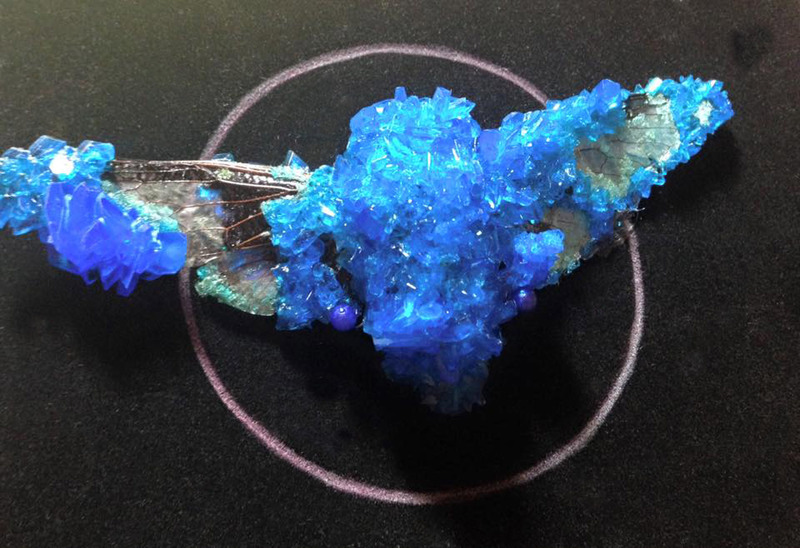 Where did you buy the bug bodies and is it acrylic paint that you use? So stunning. I wish I was one of your family members. Very beautiful work- so glad to have discovered your blog. Nice post…Love it…Would like to reblog on my blog..
Ok I’m here often, but today I see you mention a book written by friends of mine. Small world! Nice of you to link the book too. Thanks! I’m not interested in bugs, but THAT is interesting. I never would have thought. Love the artwork.